Famous British sports carmaker TVR is returning next year. And returning in some style with a new Griffith. This is no concept either - it will go on sale in late 2018 priced at £90,000. And we can't wait. It's powered by a 5.0-litre Ford V8 engine that's been 'enhanced' by Cosworth and has a six-speed manual gearbox. Despite the lack of turbochargers, it still produces 500PS. It also gets a bespoke lighter flywheel and clutch. Designed by Gordon Murray, him of McLaren F1 fame, the 2018 Griffith has a front-engined layout, a full ground-effect aerodynamic package and 50:50 weight distribution. It's also incredibly light, tipping the scales at just 1250kg thanks to carbon composite body panels. It's no slouch either, with a 0-60mph time of less than four seconds and a top speed of 200mph. It also has electric power assisted steering, which has been specifically developed for the new TVR Griffith, designed to give it easy manouevrability at low speeds. Inside the two-seater, which TVR describes as suitable for 'everyday use and long-distance driving' the designers are promising ample head room and cabin space plus 'adequate' luggage space. There is a bespoke instrument cluster and an infotainment system specially designed for TVR. The first Griffith models will come as a special Launch Edition, which gets a full leather interor, special paint options, a bespoke infotainment system and custom alloys. 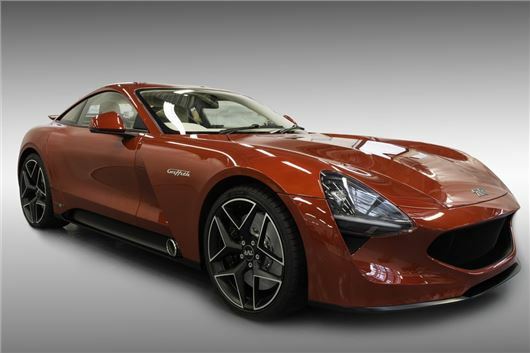 Production of the new TVR Griffith starts in late 2018. Don't know where you got the "Russian owned" from? It was bought by a Russian who didn't know what he was doing - bought back by Les Edgar ex-Aston Martin Racing and now back in British hands to be built in Wales.